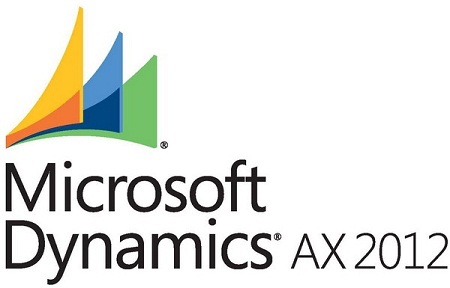 The Microsoft Dynamics AX solution is an enterprise resource planning (ERP) solution that integrates financial resource management, operations resource management, and human resource management processes that can be owned and controlled by multinational, multi-company, and multi-industry organizations, including the public sector. The Microsoft Dynamics AX solution encompasses both the Microsoft Dynamics AX application and the Microsoft Dynamics AX application platform on which it is built. The Microsoft Dynamics AX application platform is designed to be the platform of choice for developing scalable, customizable, and extensible ERP applications in the shortest time possible, and for the lowest cost. The following key architectural design principles make this possible. A Microsoft Dynamics AX end-to-end solution is delivered by many development teams working both inside Microsoft, inside the Microsoft partner channel, and inside end-user IT support organizations. The separation of concerns principle realized in the Microsoft Dynamics AX architecture makes this possible by separating the functional concerns of a solution into five globalized, secure layers. This separation reduces functional overlap between the logical components that each team designs and develops. A Microsoft Dynamics AX end-to-end solution scales to satisfy the processing demands of a large number of concurrent users. The separation of processes principle that is realized in the Microsoft Dynamics AX architecture makes this possible by separating processing into three-tiers—a data tier, a middle tier, and a presentation tier. The Microsoft Dynamics AX Windows client, the Microsoft Dynamics AX Enterprise Portal web client, and the Microsoft Office clients are components of the presentation tier; the Microsoft Dynamics AX Application Object Server (AOS), the Microsoft Dynamics AX Enterprise Portal extensions to Microsoft SharePoint Server, and Microsoft SQL Server Reporting Services (SSRS) are components of the middle tier; the SQL Server and Microsoft SQL Server Analysis Services (SSAS) are components of the data tier of the Microsoft Dynamics AX platform architecture. A Microsoft Dynamics AX application team can satisfy application domain requirements in the shortest time possible. The model-driven application principle that is realized in the Microsoft Dynamics AX architecture makes this possible by separating platform-independent development from platform-dependent development, and by separating organization-independent development from organization-dependent development. With platform-independent development, you can model the structure and specify the behavior of application client forms and reports, of application object entities, and of application data entities that run on multiple platform technologies such as the Microsoft Dynamics AX Windows client, SharePoint Server, SQL Server, and the Microsoft .NET Framework. With organization-independent development, you can use domain-specific reference models, such as the units of measure reference model; domain-specific resource-models, such as the person, product, and location models; and domain-specific workflow models, such as approval and review models, which are relevant to all organizations. The architecture of the Microsoft Dynamics AX application platform supports the development of Windows client applications, SharePoint web client applications, Office client integration applications, and third-party integration applications. Figure 1-2 shows the components that support these application configurations. 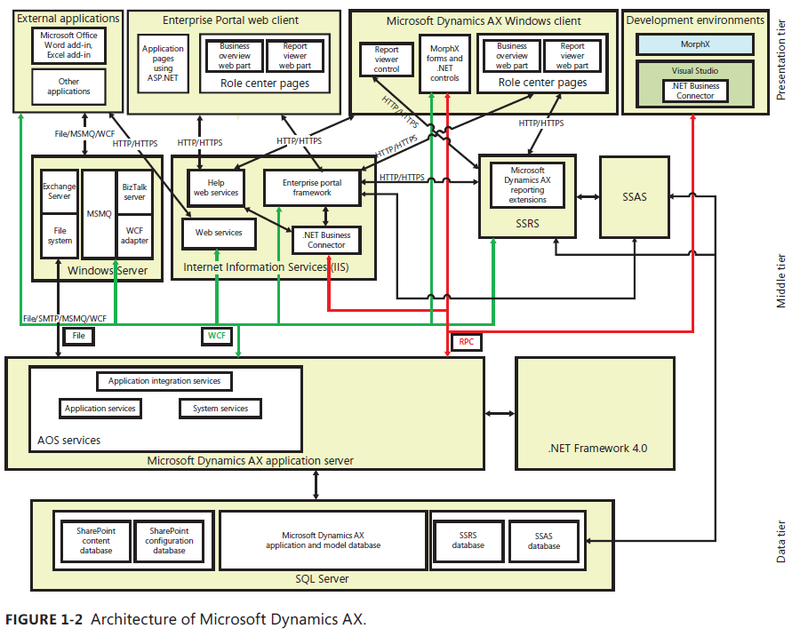 This section provides a brief description of the application development environments, and a description of the components in each of the data, middle, and presentation tiers of the Microsoft Dynamics AX platform architecture. 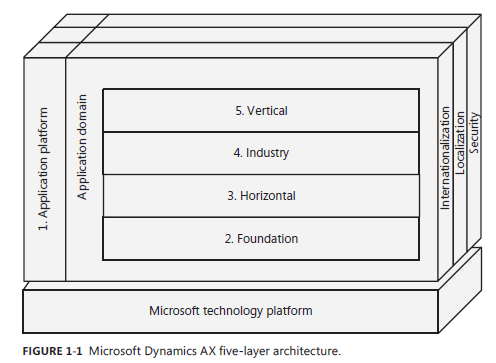 The Microsoft Dynamics AX five-layer solution architecture, illustrated in Figure 1-1, logically partitions a Microsoft Dynamics AX solution into an application platform layer, a foundation application domain layer, a horizontal application domain layer, an industry application domain layer, and a vertical application domain layer. The components in all architecture layers are designed to meet Microsoft internationalization, localization, and security standards, and all layers are built on the Microsoft technology platform. The Microsoft Dynamics AX application platform and application domain components are delivered on the Microsoft technology platform. This platform consists of the Windows client, the Office suite of products, Windows Server, SQL Server, SSAS, SSRS, SharePoint Server, the Microsoft ASP.NET web application framework, the .NET Framework, and the Microsoft Visual Studio integrated development environment (IDE). The application platform layer provides the system frameworks and tools that support the development of scalable, customizable, and extensible application domain components. This layer consists of the MorphX model-based development environment, the X++ programming language, the Microsoft Dynamics AX Windows client framework, the Enterprise Portal web application framework, the AOS, and the application platform system framework. The architecture of the components in the application platform layer is described in the following section. The foundation application domain layer consists of domain-specific reference models in addition to domain-specific resource modeling, policy modeling, event documenting, and document processing frameworks that are extended into organization administration and operational domains. Examples of domain-specific reference models include the fiscal calendar, the operations calendar, the language code, and the unit of measure reference models. Examples of domain-specific resource models include the party model, the organization model, the operations resource model, the product model, and the location model. The source document framework and the accounting distribution and journalizing process frameworks are also part of this layer. The horizontal application layer consists of application domain workloads that integrate the financial resource, operations resource, and human resource management processes that can be owned and controlled by organizations. Example workloads include the operations management workload, the supply chain management workload, the supplier relationship management workload, the product information management workload, the financial management workload, the customer relationship management workload, and the human capital management workload. The Microsoft Dynamics AX application can be extended with additional workloads. The industry application layer consists of application domain workloads that integrate the financial resource, operations resource, and human resource management processes that are specific to organizations that operate in particular industry sectors. Example industries include discrete manufacturing, process manufacturing, distribution, retail, service, and public sector. Workloads in this layer are customized to satisfy industry-specific requirements. The vertical application layer consists of application domain workloads that integrate the financial resource, operations resource, and human resource management processes that are specific to organizations that operate in a particular vertical industry and to organizations that are subject to local customs and regulations. Example vertical industries include beer and wine manufacturing, automobile manufacturing, government, and advertising professional services. Workloads in this layer are customized to satisfy vertical industry and localization requirements. Use this development environment to develop data models and application code using the Application Object Tree(AOT) application modeling tool and the X++ programming language. This development environment accesses Microsoft Dynamics AX application server services through Microsoft Remote Procedure Call (RPC) technology. Use this development environment to develop Microsoft .NET plug-ins for and extensions to Microsoft Dynamics AX clients, servers, and services; to develop for Enterprise Portal, and to develop SSRS reports. This development environment accesses the Microsoft Dynamics AX application server services through RPC. The SQL Server database is the only component in the data tier. The database server hosts the Share-Point Server content and configuration databases, the Microsoft Dynamics AX model and application database, the SSRS database, and the SSAS database. The AOS executes MorphX application services that are invoked through RPC technology and Windows Communication Foundation (WCF) technology in the .NET Framework. The AOS can be hosted on one computer, but it can also scale out to many computers when additional concurrent user sessions or dedicated batch servers are required. These components can be referenced in the AOT so that their application programming interfaces are accessed from X++ programs. The Windows Workflow Foundation (WWF) component is integral to the Microsoft Dynamics AX workflow framework, and WCF is integral to the Microsoft Dynamics AX application integration framework. These services process requests for analytics data hosted by the SQL Server component in the data tier. The reporting extensions provide SSRS with features that are specific to the Microsoft Dynamics AX application platform. These extensions access the AOS through WCF services and access SSAS through HTTP and HTTPS. This framework extends the SharePoint application platform with features that are specific to the Microsoft Dynamics AX application platform. The Enterprise Portal framework composes SharePoint content with Microsoft Dynamics AX content accessed from the AOS through the .NET Business Connector and RPC, and content accessed from SSAS and SSRS through HTTP and HTTPS. Enterprise Portal is typically hosted on its own server or in a cluster of servers. This web service processes requests for Help content. The Microsoft Dynamics AX system services can be deployed to and hosted by IIS. These services provide durable message queuing and transformation services for integration clients. Microsoft Dynamics AX MorphX and .NET programs developed in MorphX and Visual Studio. The client application communicates with the AOS primarily by using RPC. The client composes navigation, action pane, area page, and form controls for rapid data entry and data retrieval. Form controls have built-in data filtering and search capabilities and their content controls are arranged automatically by the Intellimorph rendering technology. The client additionally hosts role center pages rendered in a web browser control. This client executes MorphX application models, X++ programs, and .NET Framework programs developed in the MorphX development environment, Visual Studio, and the SharePoint Server framework. Enterprise Portal is hosted by the Microsoft Dynamics AX runtime, the ASP.NET runtime, and the SharePoint runtime environments. SharePoint and ASP.NET components communicate by means of the Microsoft Dynamics AX .NET Business Connector. The Microsoft Word client and Microsoft Excel client are extended by add-ins that work with the Microsoft Dynamics AX platform. These clients integrate with the Microsoft Dynamics AX platform by means of integration service components such as the file system, Microsoft Message Queuing (MSMQ), Microsoft BizTalk Server, and a WCF adaptor.